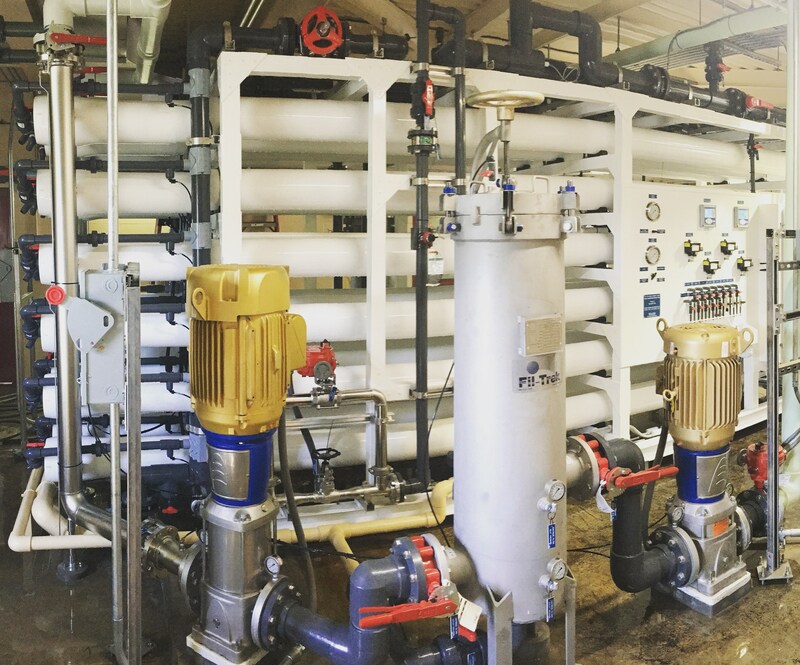 Related Blog: Control Narrative: How Do Water Treatment Plant SCADA & RO Membrane Treatment Systems Communicate? It should be noted that the filter housing and associated filter cartridges are designed to protect the membranes from an occasional well upsets that may introduce solid material into the raw well water stream. The cartridge filtration equipment is not designed nor intended to reduce turbidity or suspended solids concentration on an ongoing basis. Should the feedwater turbidity regularly exceed 1 nephelometric turbidity unit (NTU), or the silt density index (SDI) 3.0, additional filtration equipment will be required otherwise it is likely that chemical cleaning will be required on a frequent basis with an accompanying decrease in membrane life. Raw feed water enters the inlet of the cartridge filter under normal well line pressure. Wound polypropylene filter cartridges are arranged in such a manner that the raw feed water is forced through the filter from the outside to the inner hollow core of the cartridges. Here the filtered water is collected and channelled to the filter housing outlet port. Flow through the filter cartridge housing should not exceed 5 gpm per 10 inch equivalent filter length on a normal operational basis, otherwise filtration efficiency will be lowered, dP will increase and cartidge filter life will be severly reduced. Excessive pressure loss across the cartridge prefilter (>15 psi) can reduce the available suction pressure to the R/O feed pump, resulting in a low suction pressure shutdown fault. An increase in the dP across the filter indicates that the filter cartridges are overloaded with particulate material. To measure the filter differential pressure, simply read the upstream and downstream pressure gauges and calculate the difference. Upon startup with clean filters, the differential pressure should be less than 2 psi. They should be run until the dP rises to the 10 – 15 psi range and then changed. When the dP reaches 10 psi the rate of change is usually increasing rapidly and the time taken to reach 15 psi will usually be quite short. If the differential pressure does not increase, the filter cartridges should be changed every six months regardless to avoid the filters becoming centers for bacteria growth. The cartridge filter has individual inlet and outlet pressure gauges. They should be checked at least once a shift and the readings recorded in the operating log to determine when the cartridges need to be changed.